Collective memory and expressions of remembrance have been fashionable topics among historians of the last generation or so; it seems like European historians prefer to focus on the culture of remembrance that developed after World War I while American historians dwell on that of the Civil War. These were devastating conflicts in so many ways. And of course World War II has its own unique commemorative culture. I find that holidays in general, and summer holidays in particular, are a great time to develop, or solidify, a sense of place, an increasingly elusive feeling in this generic world. Given the fact that we’re in an anniversary year–the 15oth anniversary of the beginning of the Civil War–I decided to follow the path laid out by the Grand Army of the Republic (G.A.R. 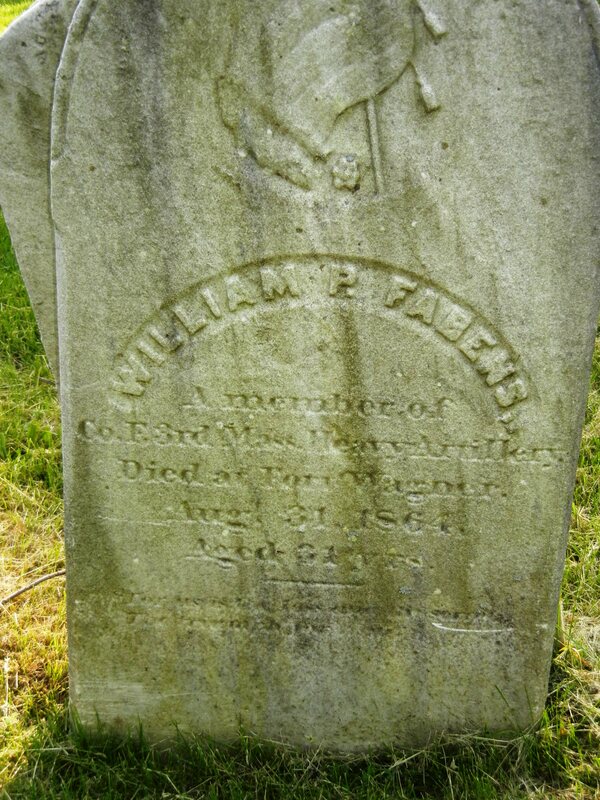 ), America’s first veteran’s organization and the inspirational force behind Memorial Day ( which was first known as “Decoration Day” and exclusively devoted to Civil War veterans) and examine Civil War remembrance here in Salem. 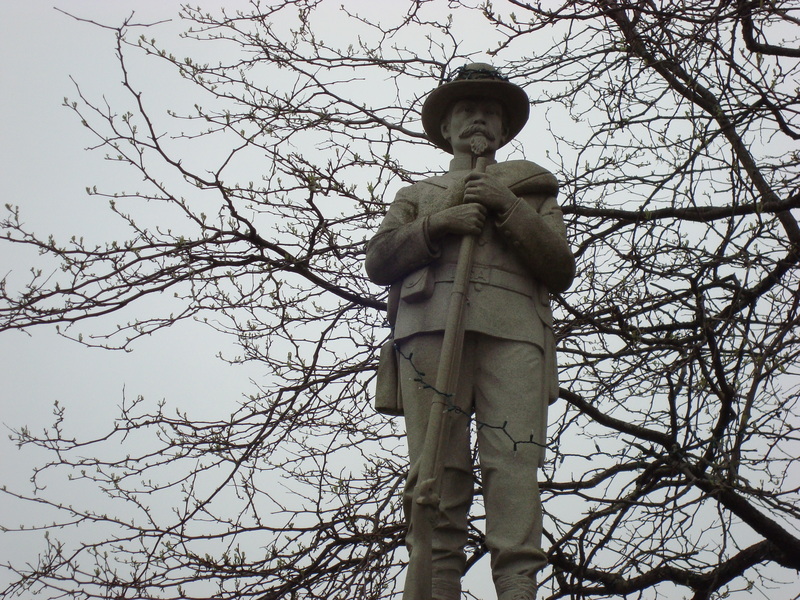 Before I get to Salem, a brief detour back to my hometown of York, Maine, where the Civil War statue resembles a CONFEDERATE officer, or at least what we have come to perceive as a Confederate officer. He looks odd not because he is incorrectly garbed but because he is anachronistically garbed, in the Spanish-American War uniform that was contemporary to the time of his creation in 1906. This statue, like all historical monuments, is reflective of both the time of its installation and the time it commemorates, perhaps more so the former than the latter. Back to Salem. There is a Civil War plaque adjacent to the Common but the cemeteries provide a less perfunctory form of commemoration, I think. 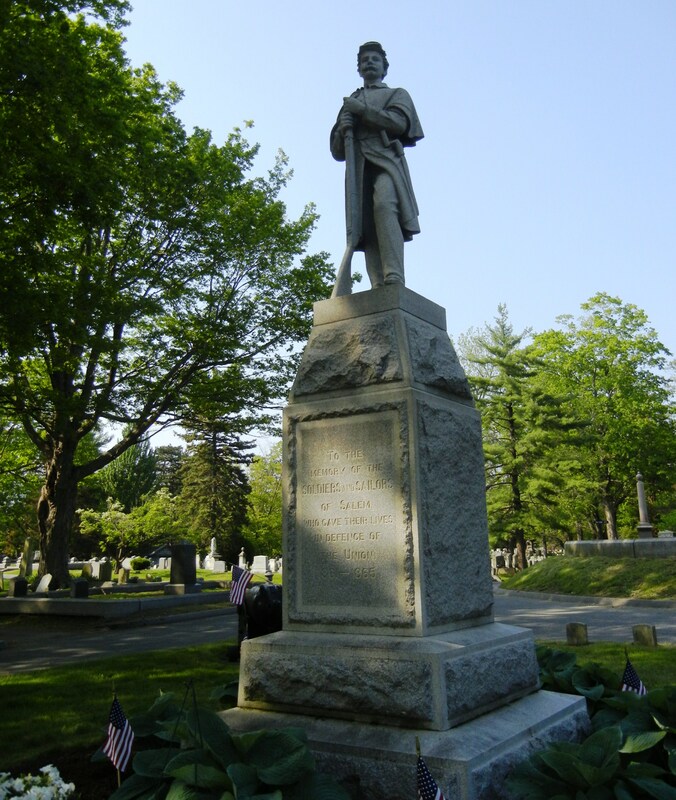 Salem has many old cemeteries, but the two newest and largest ones, Greenlawn and Harmony Grove, have the most Civil War grave sites as well as designated shrines. 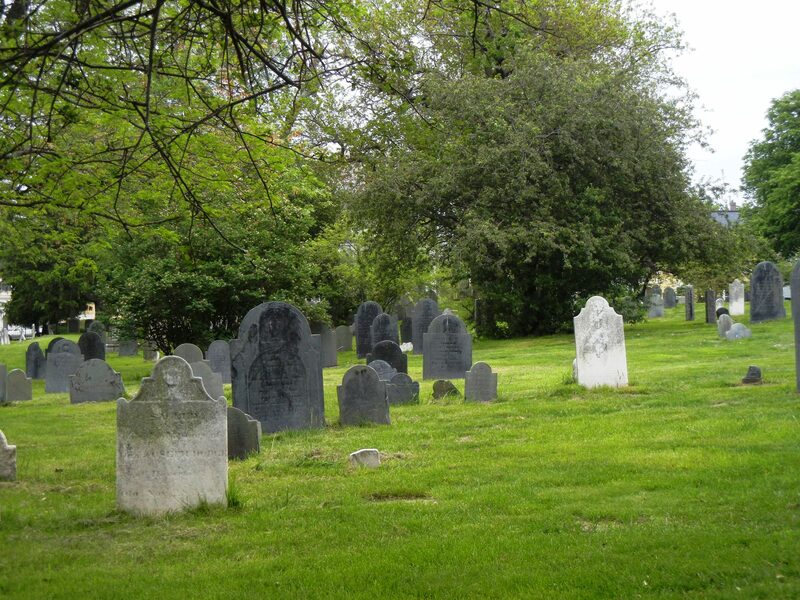 Both are nineteenth-century “garden” cemeteries; Greenlawn is public and thus a little worse for wear while Harmony Grove is private though still very accessible. 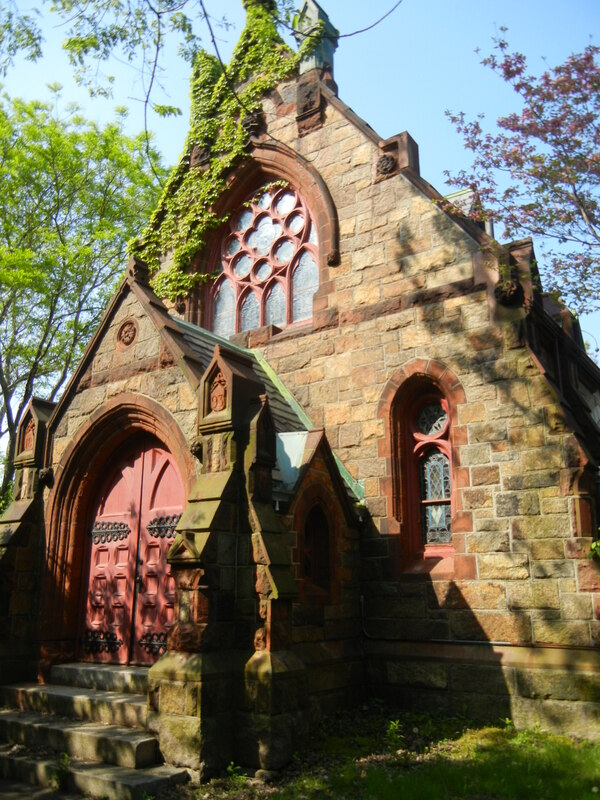 Actually, Greenlawn’s slight shabbiness adds to its poignancy, represented so well by the Gothic Dickson Chapel in its midst. Down the path to the monumental Civil War statue, dedicated in the 1880s, surrounded by the graves of Salem men who lost their lives during the War between the States. 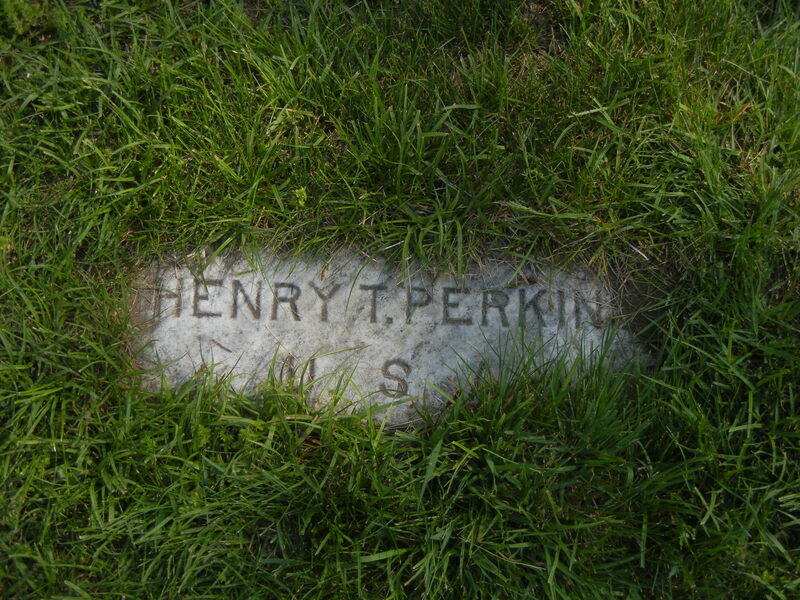 Their markers are very subtle, so obscured by grass you don’t realize what they are until you’re right on top of them. All the attention is focused on the large monumental anonymous (but recognizable) Union soldier in the center of the mound, who represents all of them. 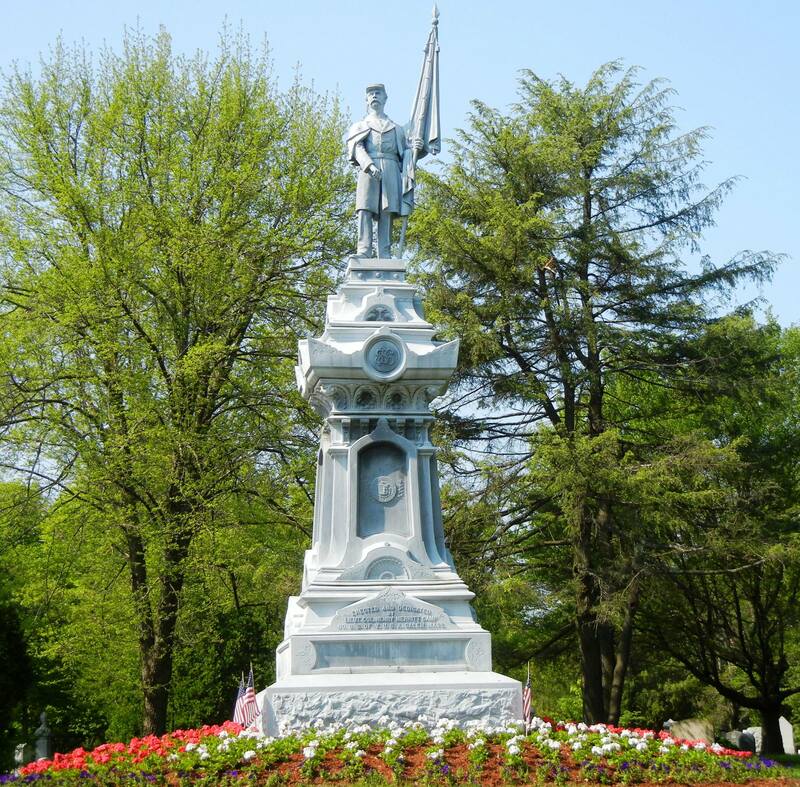 This statue bears all the marks of the official Civil War commemorative organizations, both the G.A.R and the Sons of Union Veterans of the Civil War. 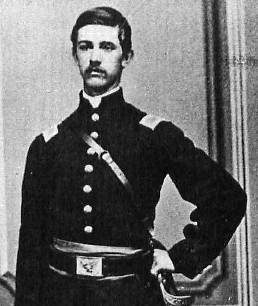 Lieutenant Colonel Henry Merritt, the namesake of the SUVCW Camp, was killed at the battle of New Bern in April of 1862. 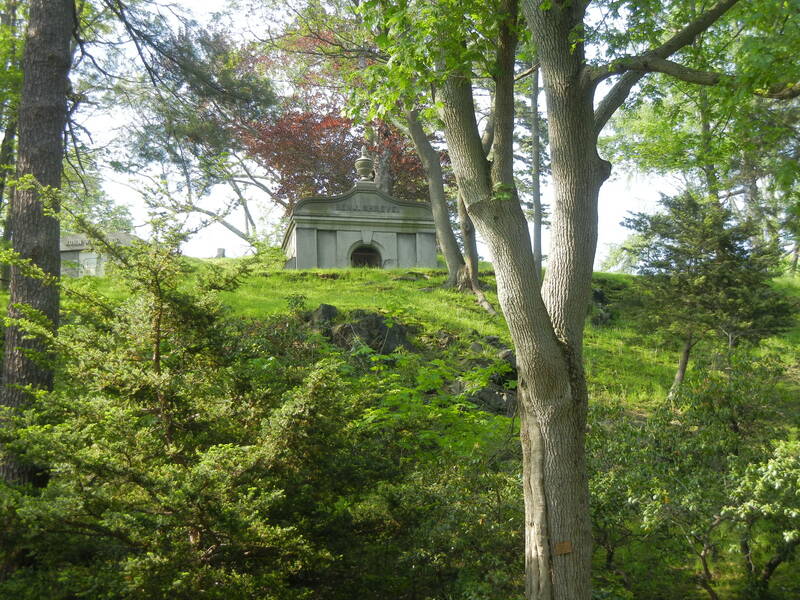 Over to Harmony Grove, a beautiful, terraced cemetery laid out in a series of winding paths lined by the crypts and semi-enclosed plots of some of Salem’s most prominent families. Despite a circle of decommissioned cannons, Harmony Grove’s Civil War installation is not as impressive as Greenlawn’s, and many of the individual soldier’s graves are in a deteriorating condition. 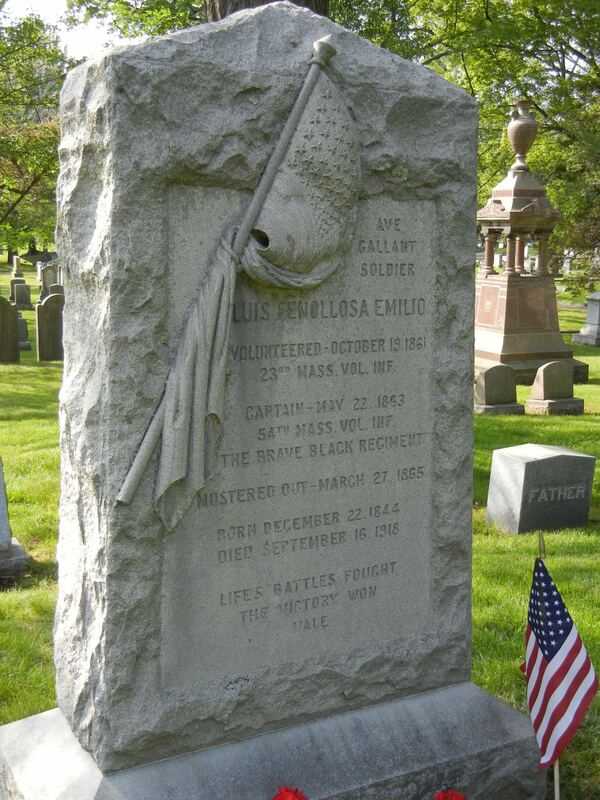 A bit further down the path, however, is the impressive grave of one of Salem’s most eminent Civil War heroes, Luis Fenollosa Emilio (1844-1918). 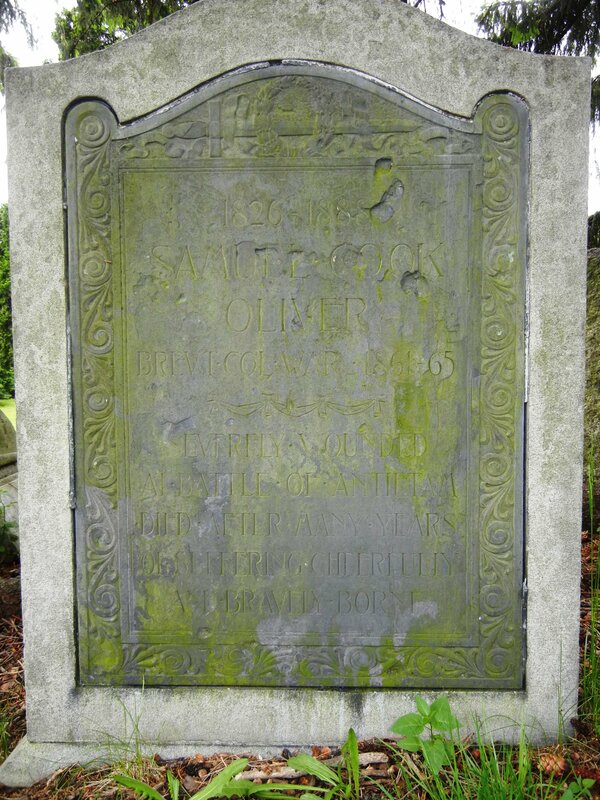 Emilio was part of the amazing Fenollosa-Emilio family of Salem, Spanish immigrants and ardent abolitionists. He was a cousin to Ernest Fenollosa, the future Japanese cultural minister who I wrote about in an earlier post. 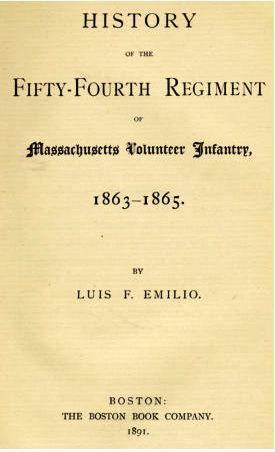 Even though he was only 16, Emilio had enlisted in the army at the beginning of the Civil War, and when Massachusetts Governor John Andrew created the first Northern black regiment in 1863, the 54th Massachusetts Volunteer Infantry Regiment (memorialized in Glory), he sought and received an officer’s commission. In fact, Captain Emilio was the only officer of the 54th who survived the disastrous assault on Fort Wagner and successive conflicts to tell the tale of the Regiment, which he did in A Brave Black Regiment. 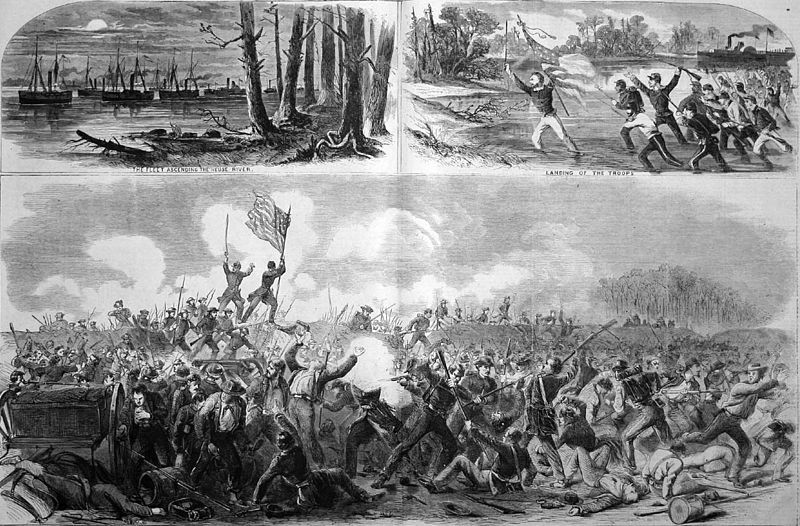 The History of the Fifty-Fourth Regiment, or Massachusetts Voluntary Infantry, 1863-65 (1891). Wrapping up my cemetery tour, I took a walk through the much older and smaller graveyard near my home. There were no flags here; these veterans lie unacknowledged. 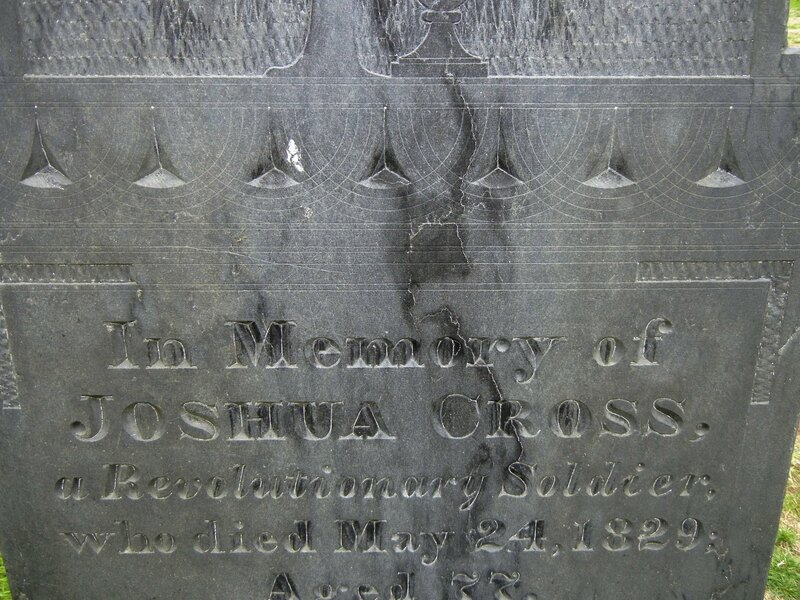 Two particularly poignant markers caught my eye, one of a seldom-heralded Revolutionary War soldier named Joshua Cross, and the other of Samuel Cook Oliver, a Civil War veteran who was severely wounded at the Battle of Antietam [and] died after many years of suffering cheerfully and bravely borne. This entry was posted on Monday, May 30th, 2011 at 10:29 am	and tagged with abolitionism, Culture, holidays, Home and posted in History, Salem. You can follow any responses to this entry through the RSS 2.0 feed. I’m a little late to this post, Donna, but I found it fascinating. Remind me to show you Drew Faust’s (Harvard’s President) book about death, dying, and memory during and after the Civil War. 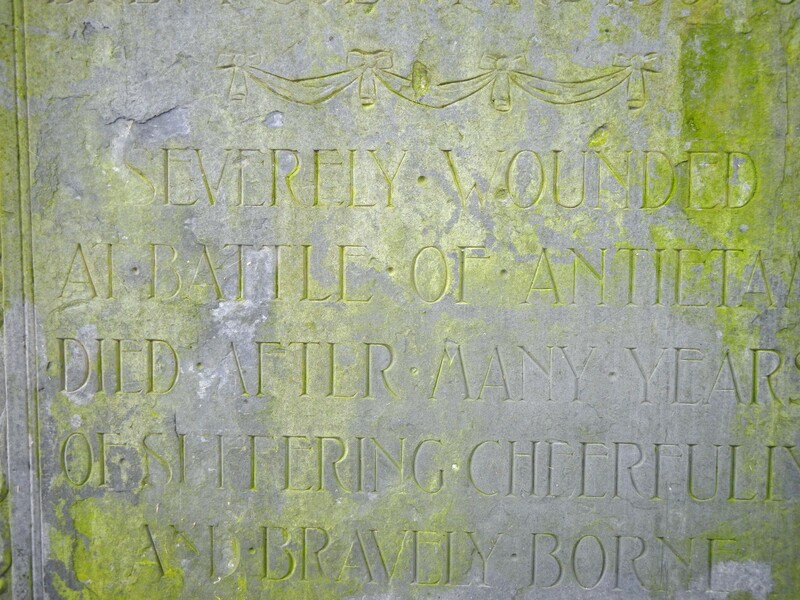 She’s included a lot about cemetaries and mass burials of Union soldiers. Look for _This Republic of Suffering_, you know, in your spare time. Fascinating post. Question for you on another matter. I will be visiting my daughter in Boston in the Spring, as she is going to attend Boston University for a few months. Is Salem near enough to Boston for a short one day visit? It looks like a place I would really like to spend a day wandering around, and would one day be sufficient to get to see the sites? Bernadette, how exciting for your daughter! Salem is just a half-hour north of Boston on the train, so it’s a perfect day trip (although Spring is not really our best season). Had no idea Emilio was buried here. Making out his middle name on the stone Japan came to mind as the only context in which I knew the name Fenollosa, but that seemed so far-fetched… Amazing. Thanks for stopping by–you might also be interested in my post on Fenollosa: “Salem’s Orientalist”. 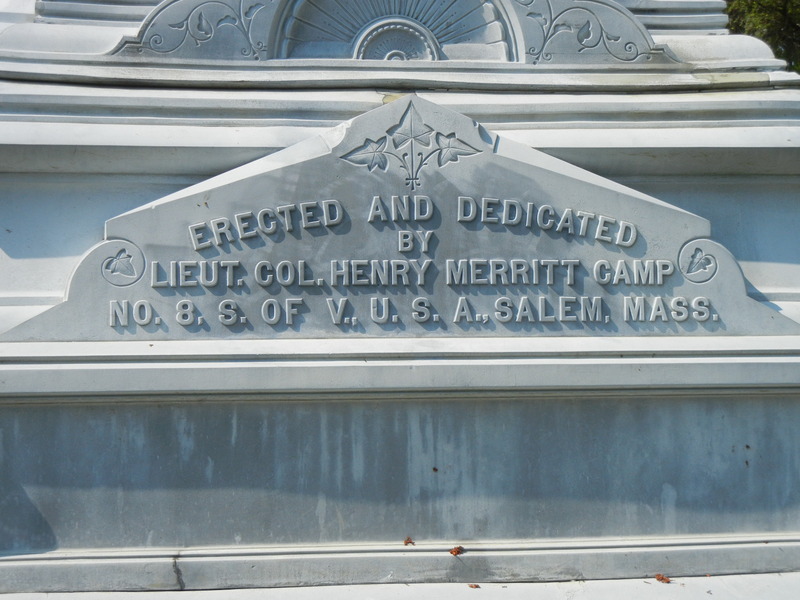 Perhaps you can answer the question why Salem’s Civil War monuments are tucked away in rarely visited cemeteries, while nearby towns place theirs in central prominent places? Think the glorious column in the center of Peabody Square. I can’t, but it is an interesting one. Salem had a very powerful GAR and I assume they could get statues wherever they wanted. When you think about it, Salem seems to prefer centralized “cultural” heroes rather than military ones. Funny you should ask: I was just thinking about our statues because of all the ones that are being pulled down in the south.